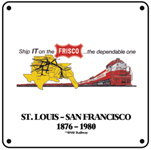 The St. Louis-San Francisco RR (FRISCO) is today part of the BNSF Railway. Frisco Lines stretched across the mid section of America. Individual marks are licensed marks owned by BNSF Railway Company and are used under an active license agreement. Famous FRISCO 4-8-2 Mountain type #1522 is perhaps the most famous steam locomotive in the mid-west, pulling folks all over Missouri and Kansas for years. So authentic you just might feel the heat. 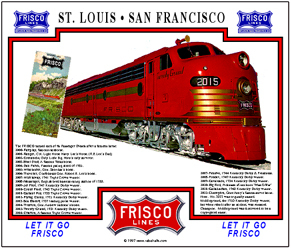 St Louis San Francisco, the FRISCO named its passenger diesels after famous horses, such as Robert E Lees Traveler and more. The FRISCO Mouse pad lists all the names and numbers. 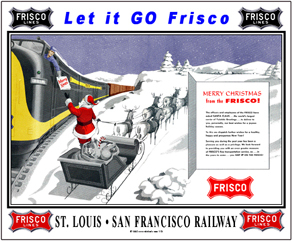 Reproduction of an ad ran by the FRISCO Railroad during the 1941 World War II build up of military bases on or near its line. A very interesting slice of American WWII history. 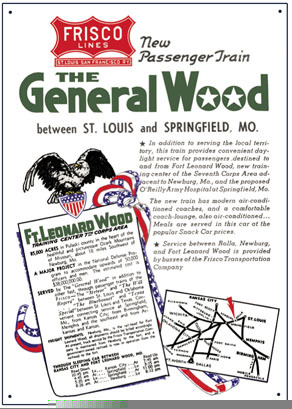 General Wood was named for Ft. Leonard Wood military base. 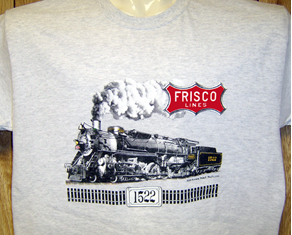 Remembered for it years of excursion service out of St Louis, the Frisco 1522 is beloved by all Frisco railfans. She is now stored at the St. Louis Transport Museum. 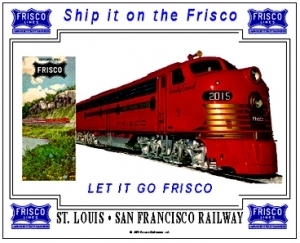 The St Louis-San Francisco Railroad, The FRISCO, named its beautiful passenger diesels after famous horses, most Kentucky Derby winners some military i.e. Traveler, General Robert E. Lees famous horse. One of the very last diesels purchased by the FRISCO Railroad, these GP50 diesels were a sight to behold. 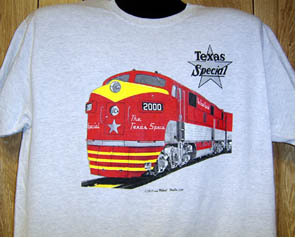 Coffee Mug featuring the FRISCO Railroads logo superimposed over the paint scheme of its freight diesel locomotives. A very unique way to present the railroads logo. 6 inch x 6 inch square tin black logo sign of the Frisco Railroad. 6 inch x 6 inch square tin of the FRISCO Line map with diesel powered train. 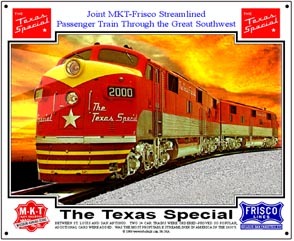 6 inch x 6 inch square tin of the FRISCO Lines Lone Star Limited passenger train. A very unique logo. 6 inch x 6 inch square tin Red logo sign of the Frisco Railroad. 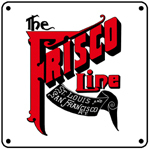 6 inch x 6 inch square tin of the FRISCO Line time table cover in the 1800s. A very unique image. Pad featuring the famous steam No. 1522. 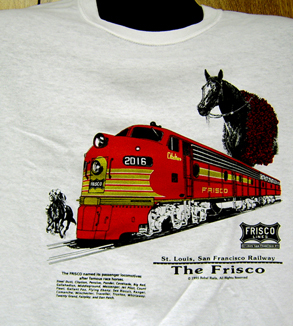 The Frisco Railroads passenger E-8 diesels were named after celebrity horses, such as Kentucky Derby winners, General Robert E. Lees Traveler and many more. 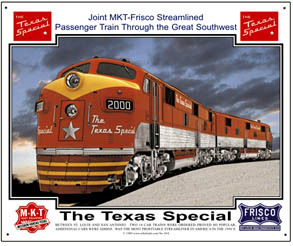 The Frisco Railroads last series of diesels were these orange and white EMD GP-50 locomotives, before being merged into the BN. 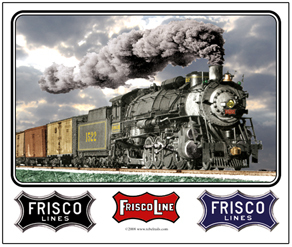 Beautiful Frisco passenger E-unit diesel blazes across this tin sign with a period time table cover. 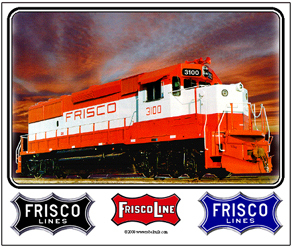 The Frisco named its passenger diesels after famous horses, such as Sea Biscuit, General Lees Traveler and more. 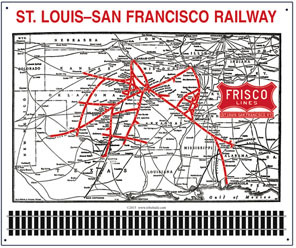 Reproduction of a 1941 system map of the FRISCO Railroad. Very interesting to see all the major and minor cities and towns served by the St. Louis-San Francisco Railroad.